CARD Workshop for Siblings of Children with ASD - Tuesday! 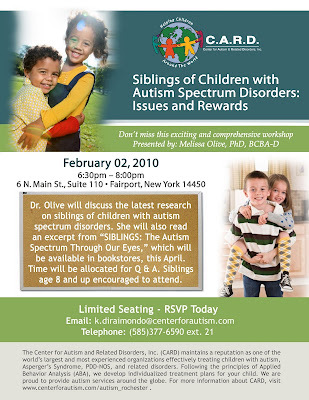 Center for Autism and Related Disorders offers FREE Challenging Behavior Workshops in New York - this February! JOIN CARD at the AUTISM/ ASPERGER'S CONFERENCE in ANAHEIM, CA - FEB 6-7! The 4th Annual Anaheim Autism/Asperger’s Conference, considered the most comprehensive autism conference series in Southern California, will be held February 6-7, 2010 in Anaheim, California in the Anaheim Convention Center. The conference is designed for parents, caregivers and practitioners. The Center for Autism and Related Disorders' (CARD) Founder Dr. Doreen Granpeesheh is Sunday's Keynote Speaker. Dr. Granpeesheh will present, "Understanding and Treating Anxiety in Individuals with Autism Spectrum Disorders." Individuals with Autism Spectrum Disorders often present with anxiety disorders that cause significant functional impairments. While Anxiety Disorders such as Generalized Anxiety, Obsessive Compulsive Disorder, Phobias and other anxiety symptoms are common amongst individuals with ASD, the identification and treatment of these comorbid disorders are made more difficult by the concurrent presence of communication delays, behavior problems and the lack of standardized assessments for patients with ASD. This presentation reviews the literature on prevalence, features and assessment of anxiety in ASD individuals and offers guidelines for treatment through the use of cognitive behavioral protocols that have been found to be effective in this field. CARD Founder to Speak at Defeat Autism Now Spring Conference! 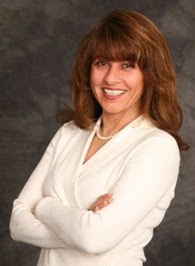 CARD Founder and Executive Director Doreen Granpeesheh, PhD, BCBA-D is scheduled to speak at the 2010 ARI/Defeat Autism Now! Spring Conference in Baltimore, Maryland. The Autism Research Institute and Defeat Autism Now! (DAN!) will host its 2010 Spring Conference on April 8-11, 2010 at the Marriott Waterfront Hotel in Baltimore, Maryland. The conference will feature level one and level two clinician seminars, a nutrition seminar, and both science and parent workshop tracks. Clinician and Nutrition Seminars Nurses, doctors, and other healthcare professionals may qualify for continuing medical education (CME) credits for attending the level one or two clinician seminar as well as the nutrition seminar. Seven AMA-PRA Category 1 CME credits are available for each day of the clinician and nutrition seminars. The level one seminar serves as an introduction to autism treatments, including gastrointestinal issues and metabolic concerns. The level two seminar is designed to provide more in-depth information for healthcare professionals that have experience working with individuals on the autism spectrum. In addition to the CMEs that are available for the clinician and nutrition seminars, up to 7.5 CME credits may be received for attending the science session on April 10 and five CME credits for the Sunday, April 11 science session. Parent and Caregiver Workshops ARI and DAN! have created a series of workshops designed to meet the information needs of parents and caregivers of children with autism. Dr. Granpeesheh has dedicated thirty years to helping individuals with autism lead healthy, productive lives. Dr. Granpeesheh started her studies in autism as an undergraduate student at UCLA. While completing her graduate degree there, she worked with Dr. Ivar Lovaas on the world‐renowned outcome study published in 1987 which showed a recovery rate of close to 50% among the study’s research participants. She earned a PhD in Psychology from UCLA in 1990. Dr. Granpeesheh is licensed by the Medical Board of California, the Texas and Arizona State Boards of Psychologists, and the Dubai Healthcare City. She earned a Certificate of Professional Qualification in Psychology from the Association of State and Provincial Psychology Boards and is a Board Certified Behavior Analyst. She is an active member of many boards whose mission is to advance the treatment of autism. She is on the Scientific Advisory Board of the US Autism and Asperger's Association and is the first vice chair of the national board of directors of the Autism Society of America. She is a member of the Autism Human Rights and Discrimination Initiative steering committee and the oversight committee of the Department of Developmental Disabilities for the State of Arizona. She is the founding member and President of ACT Today! (Autism Care and Treatment) a non‐profit organization that helps families access effective treatment. Dr. Granpeesheh founded the Center for Autism & Related Disorders (CARD) in 1990. Today, CARD is a worldwide leader in providing effective autism treatments to About Doreen Granpeesheh, PhD, BCBA‐D thousands of clients. CARD provides both regional and remote services around the globe through its 18 satellite sites in California (9 sites), New York (2 sites), Virginia, Illinois, Texas, Arizona, Australia, and New Zealand. With a mission to increase access to the most effective treatments, CARD has developed strong working relationships with parent organizations, schools and government agencies all over the world, including the Middle East, Europe, and Hawaii. Dr. Granpeesheh is known throughout the world as an expert in the field of autism research and treatment. Specific areas of expertise and research include curriculum development from early intervention through the early stages of adulthood, assessment, language skill acquisition, feeding, pill swallowing, the use of Hyperbaric Oxygenation Therapy, long‐term outcomes, and the effects of reductions in treatment hours. She has trained thousands of professionals and families on her treatment techniques and curriculum, leading to a faster dissemination of quality treatment information. She is often sought to speak at the most prestigious autism and behavior analysis conferences, including Autism One, Association for Behavior Analysis, Defeat Autism Now, and the Autism Society of America. Through her active participation and direction in research, curriculum development and treatment, Dr. Granpeesheh has consistently demonstrated the effectiveness of Applied Behavior Analysis intervention. She has not only helped tens of thousands of families, but has successfully helped many children and young adults attain their highest potential, giving further merit to the notion that autism is treatable and that individuals affected can lead independent, meaningful lives. A Center for Autism and Related Disorders, Inc. (CARD) research study, “Evaluation of a Multi-component Intervention for Diurnal Bruxism in a Young Child with Autism,” finds the combination of vocal and physical cueing can effectively treat teeth grinding in young children with autism. The Journal of Applied Behavior Analysis has published the findings in its current issue. The study implemented a multi-component intervention, consisting of a vocal and a physical cue to decrease rates of bruxism. A partial component analysis suggested that the vocal cue was only effective at decreasing levels of bruxism when paired with a simultaneous physical cue. Bruxism consists of forcefully grinding one’s teeth together. Chronic nocturnal (night-time) or diurnal (daytime) bruxism can have many negative effects for the person engaging in the behavior, including abnormal wear on the teeth, damaged gum and bone structures, facial pain, and tooth sensitivity. Previous research on the treatment of diurnal bruxism has often used aversive procedures (for example, brief application of ice to the cheeks or chin in response to teeth-grinding) or the use of protective devices, such as occlusal splints (plastic devices placed in the mouth that prevent teeth from grinding together). A far less intrusive option is the use of a combined vocal and physical cueing procedure, which CARD used in its study. CARD treated the bruxism of “Abby,” a 6-year-old girl with autism. All sessions conducted for the study were embedded within the girl’s ongoing home-based Applied Behavior Analysis (ABA) therapy sessions. The treatment CARD used was a combination of vocal and physical prompting procedures. Each time that Abby began grinding her teeth together, her ABA therapist implemented a vocal prompt by asking Abby to say, “Ahh,” (a behavior that was incompatible with grinding her teeth), while simultaneously physically prompting her to open her mouth by using one finger to apply light pressure to her chin. The treatment successfully reduced Abby’s bruxism. In order to determine whether it would be possible to eliminate the physical prompt, therefore making the procedure easier to implement and less intrusive, CARD discontinued the physical prompt and implemented the vocal prompt only. Unfortunately, the behavior returned to high levels and so the physical prompt was reinstated, again successfully decreasing the behavior. Follow up data were also collected for three weeks, one time per week, and showed that the treatment maintained low levels of bruxism. Questions regarding this study should be directed to Dr. Jonathan Tarbox, CARD Director of Research at j.tarbox@centerforautism.com or 818.345.2345. CARD is committed to science as the most objective and reliable approach to evaluating treatment for autism. CARD’s mission is to conduct empirical research on the assessment and treatment of autism and to disseminate CARD’s research findings and derived technology through publication and education of professionals and the public. While the primary focus of CARD’s research is ABA-based methods of assessment and treatment, CARD’s overall approach to research includes any topic which may hold promise for producing information that could improve the lives of individuals with autism. 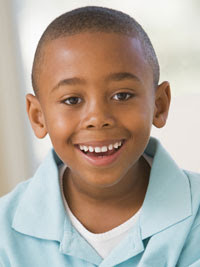 In addition, CARD maintains a reputation as one of the world’s largest and most experienced organizations effectively treating children with autism, Asperger’s Syndrome, PDD-NOS, and related disorders. Following the principles of Applied Behavior Analysis (ABA), CARD develops individualized treatment plans for children worldwide. CARD provides both regional and remote services around the globe through its 18 satellite sites in California (9 sites), New York (2 sites), Virginia, Illinois, Texas, Arizona, Australia, and New Zealand. With a mission to increase access to the most effective treatments, CARD has developed strong working relationships with parent organizations, schools and government agencies all over the world, including the Middle East, Europe, and Hawaii. For more information about CARD, visit www.centerforautism.com . For more information about the CARD Research department, visit www.centerforautism.com/autism_research. Challenging Behavior & Picky Eating Workshop - Feb 10th! Yahoo Health News takes a closer look at autism research and development this week. This comes as many parents turn to the internet for resources on autism, autism research and development, and effective therapies. Researchers at the Center for Disease Control and Prevention (CDC) released a report this past month that shows one in 110 children is diagnosed with the developmental disorder. on autism and other medical news. 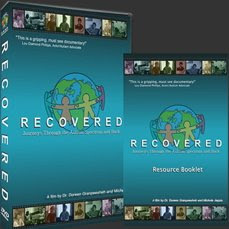 To view additional Autism Resource News and Videos, visit CARD's Multimedia site at www.centerforautism.com. Get the Autism News from Medical News Today widget and many other great free widgets at Widgetbox!